Arkansas usually is short-shifted when it comes to recognizing cultural geniuses of the past. 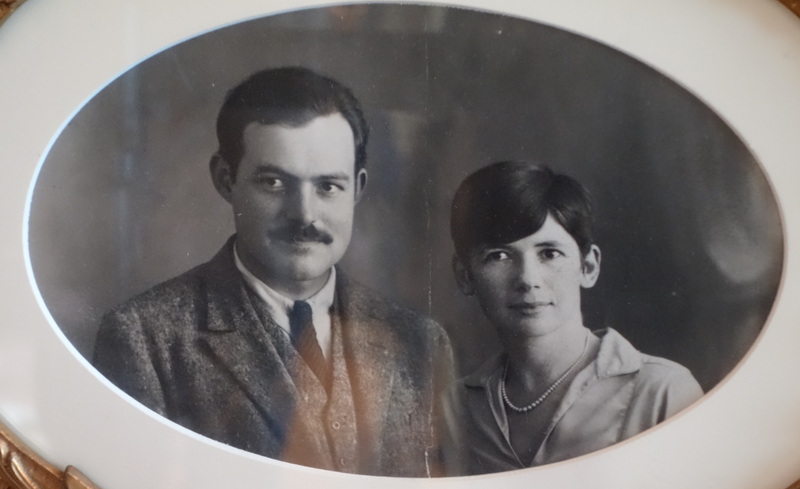 What most Americans do not realize is that Ernest Hemingway came to Arkansas via his second wife Pauline Pfeiffer. In the 1930s, Pauline’s parents converted the barn on their property into a place where Hemingway could write while visiting. He completed parts of “A Farewell to Arms” and several short stories here. 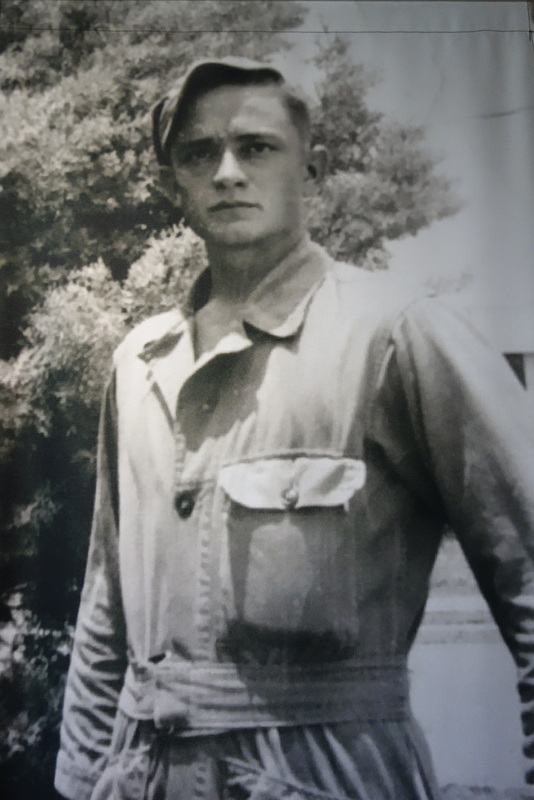 Johnny Cash and his family moved from Kingsland to Dyess, Arkansas in the 1935, and occupied a house in the Dyess colony through 1953. Arkansas was the influence and roots of his budding beginnings as a musician and singer. When we think of one of America’s literary greats – Ernest Hemingway – a genius of staccato phrasing and the short story, one of the greatest writers of the 20th century, seldom do we evoke a vision of Hemingway in Arkansas. Yet this is where he penned one of his greatest works, A Farewell to Arms. Nor do we think of Arkansas when we hum Johnny Cash’s famous songs, “I Walk the Line,” “Folsom Blues” or “Ring of Fire.” But we should. For Dyess, Arkansas is where the future singer and song writer spent his impressionable years growing up. The Dyess Colony was part of a Roosevelt experiment designed to provide homes and jobs to poor farm families during the Great Depression. And though the Cash family worked hard and had little, Johnny Cash remembers a childhood that was happy. While Ernest Hemingway was not a native son, Johnny Cash was born and raised in Arkansas. Nevertheless, both spent significant time in Arkansas and both were influenced by their Arkansas life. To put it succinctly: Arkansas impacted both men, and it was reflected in their writings and their songs. Piggott, Arkansas is a long way from nowhere; You have to want to go there as you won’t accidentally stumble upon it. Located in the upper part of northeast Arkansas, about 10 miles from the Missouri border, you can expect about a three-hour drive if you are coming from Little Rock. 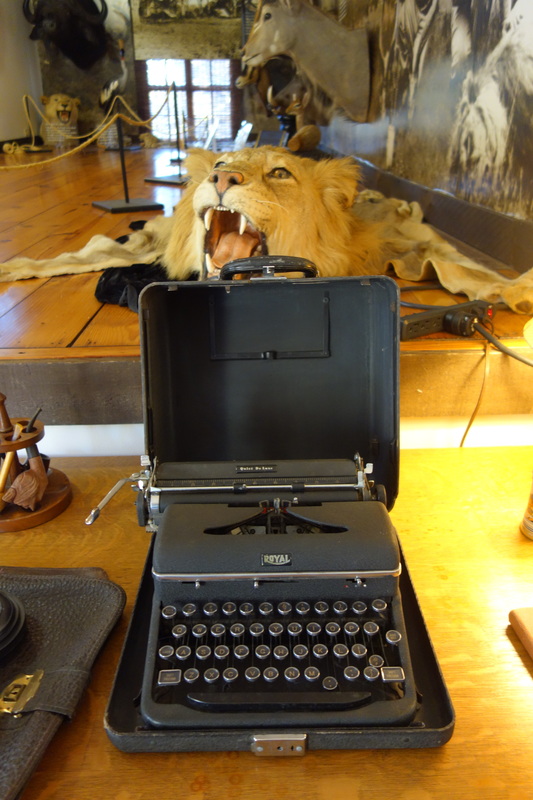 However, any fan of Hemingway will find that it is well worth the journey. 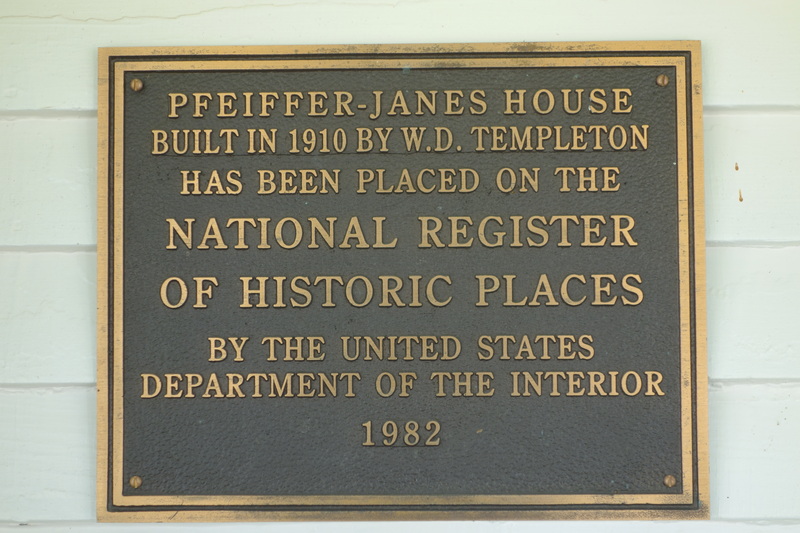 The Pfeiffer House, located at Tenth and Cherry Streets, belonged to Hemingway’s wealthy in-laws, Paul and Mary Pfeiffer. Their daughter Pauline was Hemingway’s second wife, once a good friend to both Hemingway and his first wife. He was married to Pauline from 1927 to 1940, and during this time the couple frequently came to stay at the white house estate. In addition to coming from a wealthy family, Pauline came with quite a set of credentials. Graduating from the Missouri School of Journalism in 1918, she worked for the Cleveland Press and Vanity Fair in New York before accepting a job as editor for the Paris Bureau of Vogue Magazine. She met Hemingway and his first wife Hadley in 1925 at a party in Paris. 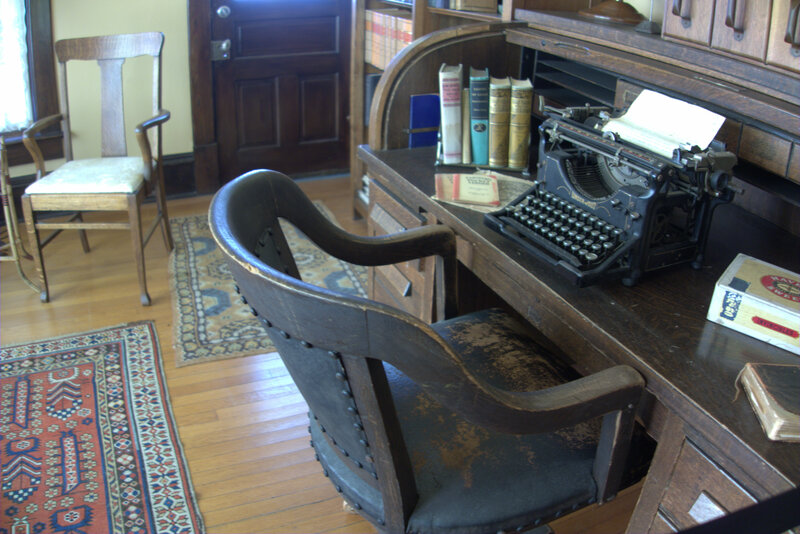 So that Hemingway would feel at home and could be productive during his time in Piggott, the Pfeiffers converted the red carriage house on their property into a working apartment and studio for him. Here he could have the privacy he required to write. And write he did. During his time he would pen his famous A Farewell to Arms, which was published in 1929. A movie was subsequently made and had its world premiere at the Franklin Theater in Piggott during December 1932. 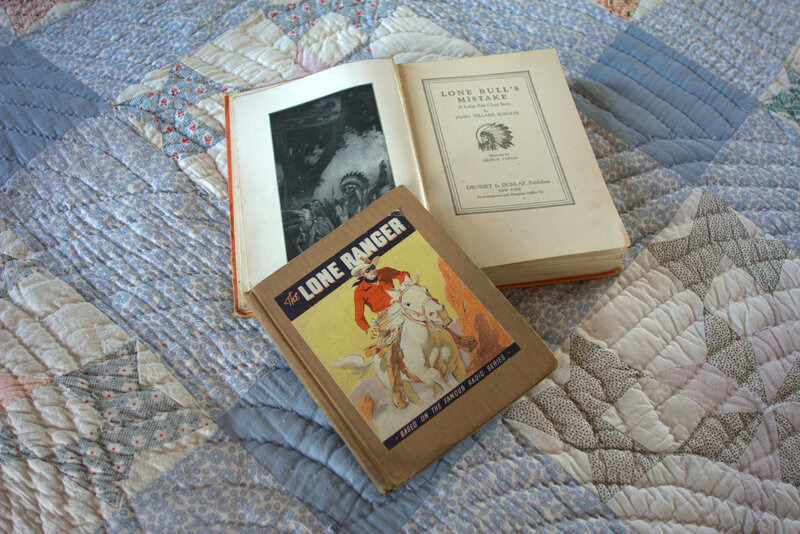 It is thought that Hemingway probably worked on fragments of seven other books and numerous short stories during the time he was married to Pauline. The Pfeiffer family was quite generous in supporting Hemingway as a writer, especially during the Great Depression. And the support from Pauline’s Uncle Gus was generous to a fault. Uncle Gus was especially close to Pauline, and after her marriage, he took a liking to Hemingway immediately. He seemed to enjoy supporting Pauline’s husband as a writer and made some of Hemingway’s field research possible through his magnanimous financing. Uncle Gus paid for the couple to travel to Africa for a safari to the tune of $25,000 during the Great Depression. He also helped pay for their apartment in Paris, a car, their home in Key West and Hemingway’s deep-sea fishing boat. Of course, the generous underwriting by Uncle Gus disappeared when Hemingway filed for divorce from Pauline so he could marry wife number three. 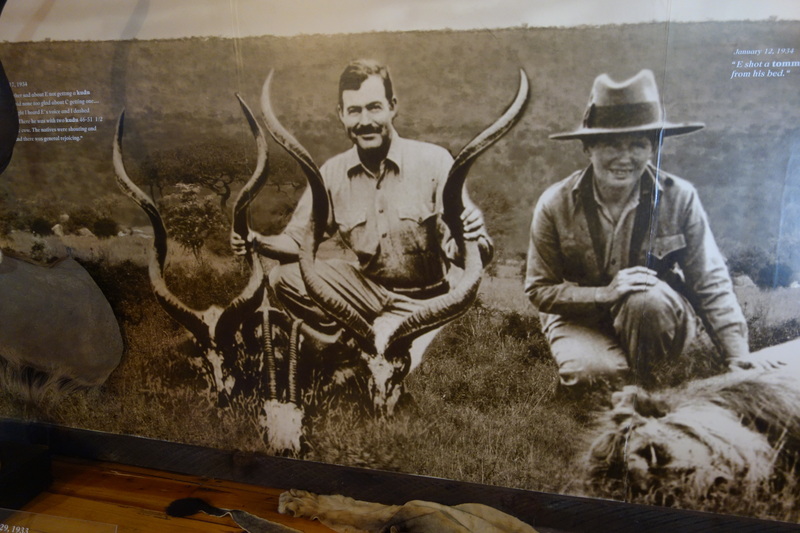 On what would have been Hemingway’s 100th birthday, the Arkansas State University opened the Hemingway-Pfeiffer Museum and Education Center in Piggott in July 1999. The barn studio behind the home, where Hemingway spent much of his time in Arkansas, is part of the museum. Surprisingly, the home still has most of its furnishing, including some of the artwork that was hanging back in the days when the Pfeiffers owned the home. As the home and barn studio are designated as an Arkansas State University Heritage Site, public tours are given on the hour from Monday-Friday, starting at 9:00 a.m. and finishing at 3:00 p.m. Tours are also given on Saturdays from 1:00 p.m. to 3:00 p.m.
Born the son of poor Southern Baptist sharecroppers, Johnny Cash – or “JR” as he was known to his family – lived in Dyess from the time he was three years old until he graduated from high school and joined the Air Force in 1950. These were impressionable years for him, when living meant scraping a meager existence from the land even as family, music and religion provided a pillar of strength that lifted them during times of adversity. The Dyess Colony was built in 1934 as part of a federal agricultural resettlement and Works Progress Administration project. It was designed to provide homes and jobs to poor farm families during the Great Depression. After the federal government purchased 16,000 acres, they built 500 farmsteads and provided for a town center that would provide medical care, schooling and even a company store. This would be the largest resettlement community in Arkansas. Indigent families were recruited from all over the state and promised 20 acres, a home and outbuildings. The only catch was that they were expected to repay the government for the farm after they cleared the land for farming. To kick start the process, the government would clear the first two acres. 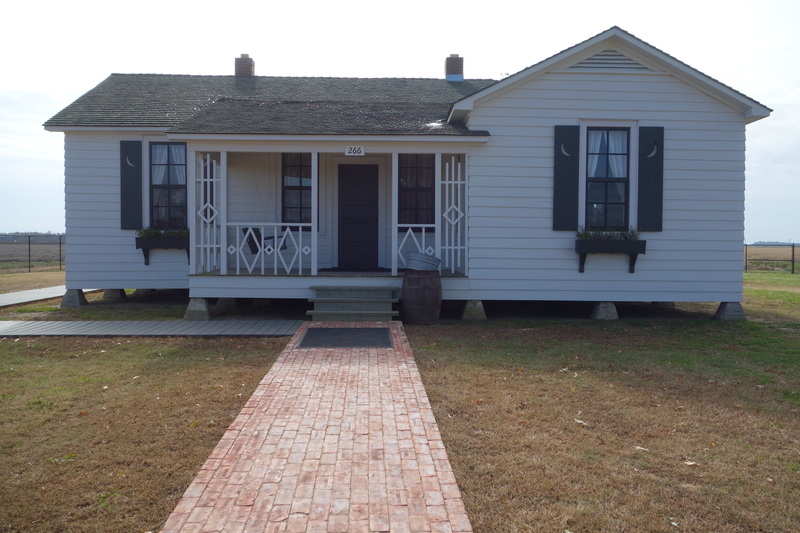 The Cash family volunteered to be resettled from Kingsland, Arkansas and moved to Dyess in 1935, whereupon, it is said that Carrie Cash (Cash’s mother) broke down and cried when she saw their new home. Her humbling remark was that the family had never had it this good. The family lived in a five-room house while farming 20 acres of cotton and other seasonal crops. All seven children, including Johnny, worked alongside their parents to eke out an existence that was still better than what they had before. They would continue to live in their Dyess home until 1953. 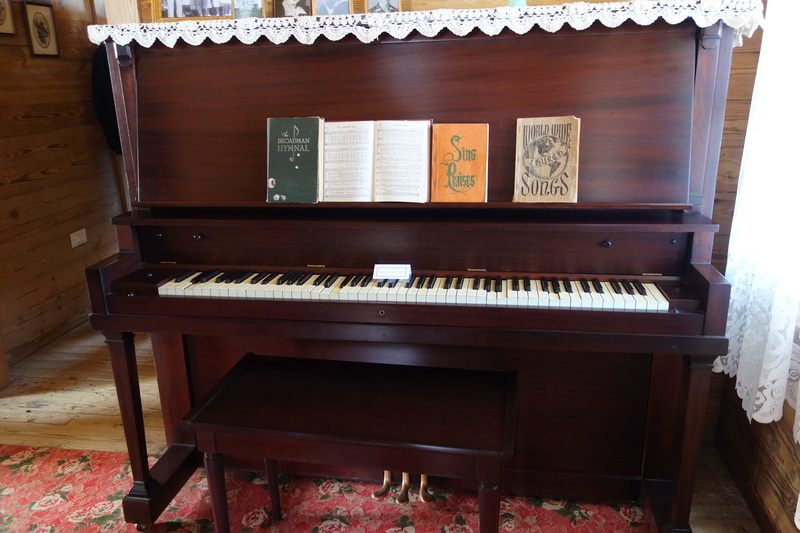 One thing all family members remember is the piano that belonged to their mother. His kind of music was minimalist in structure, yet it came with the tonality power of a booming baritone. Accompanied only by guitar, his words reverberated with a depth and density that could fill any room. Sometimes it felt like thunder. It was never meek or mild. There was no escaping the strength and intensity of his voice and the message he delivered through his music. 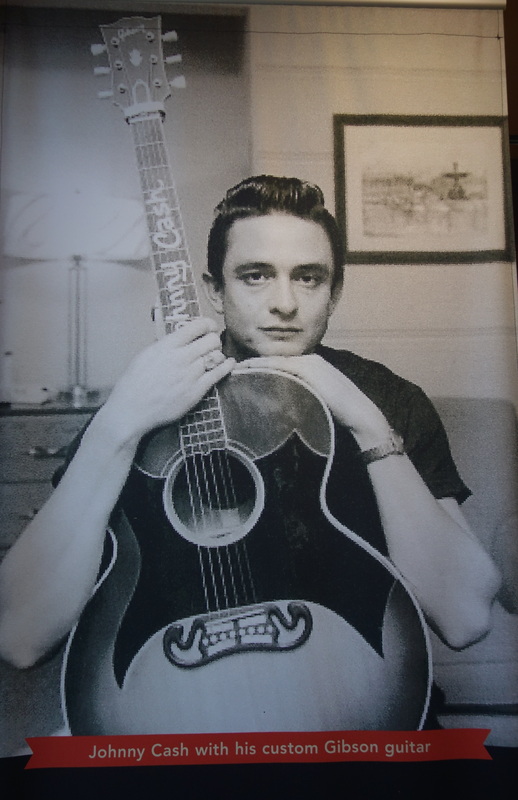 And much like his boyhood, his songs embraced both the joy and sorrows of life, delivering insights with a stark simplicity that was the essence of the man Johnny Cash. While the Dyess Colony Museum and the Cash home are completed and ready for visitors, the overall master plan is still a work in progress. (Still, you should visit the museum as it gives a rare insight into a period of American history that is seldom told.) The Arkansas State University will be developing a heritage tourism site that will include the reconstruction of other buildings at the home site and of a second colony home. This will serve as a visitor center next to the Cash home. Signage will be improved and will mark locations for the church, school, and other facilities.